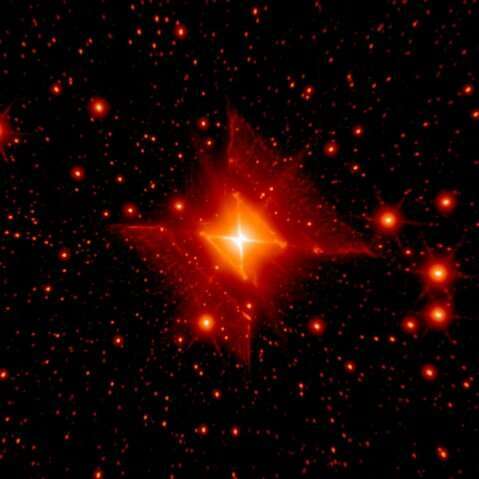 The Red Square Nebula. Image credit: Peter Tuthill, Sydney University Physics Dept., and the Palomar and W.M. Keck observatories. Now, a new study conducted by University of Colorado's John Bally and Zen H. Chia, sheds more light on the nature of RSN and its host. Using the Double Imaging Spectrograph (DIS) on the 3.5 meter telescope at the Apache Point Observatory (APO) located near Sunspot, New Mexico, the astronomers unveiled the presence of a collimated jet orthogonal to the previously identified extended nebula associated with RSN. "Deep, narrow-band images of the Red Square Nebula and its source star, MWC 922, reveal a highly collimated and segmented, parsec-scale jet oriented orthogonal to the previously identified emission-line nebula which can be traced towards the southwest," the researchers wrote in the paper. The researchers calculated that the speed of the jet is around 500 km/s and that the jet's electron density is between 50 and 100 cm-3. These parameters allowed the authors of the paper to estimate the mass loss rate of the jet segments, which was found to be at a value between 50 and 100 billionths of a solar mass per year. "Because of its orientation, the southwest part shadows the northeast part. Faint, 70 μm emission traces warm dust at the surface," the paper reads. How do they know it is Bi-Polar, could be basic Schizophrenia instead. @S, please include a smiley or similar 4x2 clue in your off-beat quips.